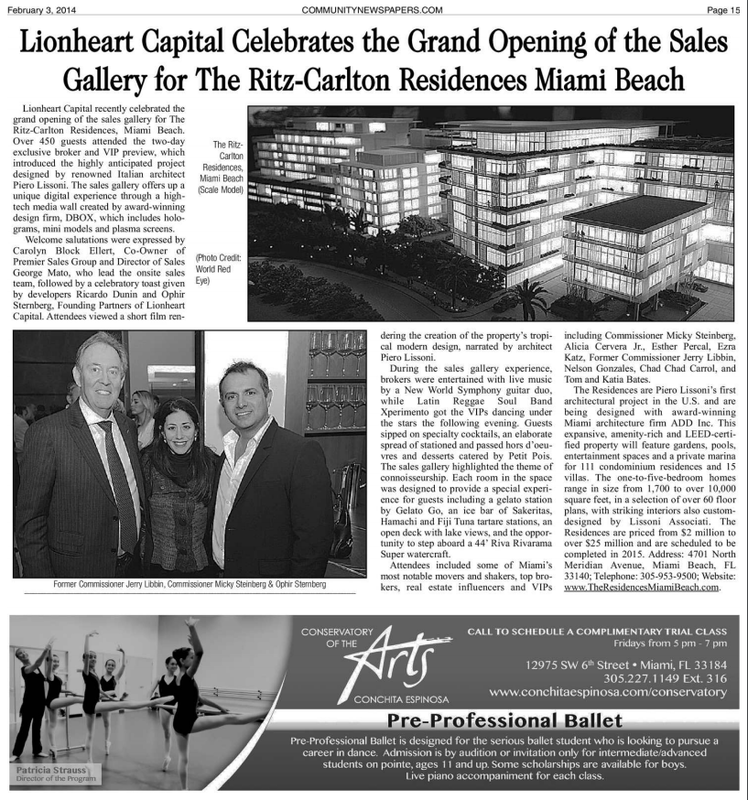 Lionheart Capital recently celebrated the grand opening of the sales gallery for The Ritz-Carlton Residences, Miami Beach. Over 450 guests attended the two-day exclusive broker and VIP preview, which introduced the highly anticipated project designed by renowned Italian architect Piero Lissoni. The sales gallery offers up a unique digital experience through a hightech media wall created by award-winning design firm, DBOX, which includes holograms, mini models and plasma screens. Welcome salutations were expressed by Carolyn Block Ellert, Co-Owner of Premier Sales Group and Director of Sales George Mato, who lead the onsite sales team, followed by a celebratory toast given by developers Ricardo Dunin and Ophir Sternberg, Founding Partners of Lionheart Capital. Attendees viewed a short film rendering the creation of the property’s tropical modern design, narrated by architect Piero Lissoni. During the sales gallery experience, brokers were entertained with live music by a New World Symphony guitar duo, while Latin Reggae Soul Band Xperimento got the VIPs dancing under the stars the following evening. Guests sipped on specialty cocktails, an elaborate spread of stationed and passed hors d’oeuvres and desserts catered by Petit Pois. The sales gallery highlighted the theme of connoisseurship. Each room in the space was designed to provide a special experience for guests including a gelato station by Gelato Go, an ice bar of Sakeritas, Hamachi and Fiji Tuna tartare stations, an open deck with lake views, and the opportunity to step aboard a 44’ Riva Rivarama Super watercraft. Attendees included some of Miami’s most notable movers and shakers, top brokers, real estate influencers and VIPs including Commissioner Micky Steinberg, Alicia Cervera Jr., Esther Percal, Ezra Katz, Former Commissioner Jerry Libbin, Nelson Gonzales, Chad Chad Carrol, and Tom and Katia Bates. The Residences are Piero Lissoni’s first architectural project in the U.S. and are being designed with award-winning Miami architecture firm ADD Inc. This expansive, amenity-rich and LEED-certified property will feature gardens, pools, entertainment spaces and a private marina for 111 condominium residences and 15 villas. The one-to-five-bedroom homes range in size from 1,700 to over 10,000 square feet, in a selection of over 60 floor plans, with striking interiors also customdesigned by Lissoni Associati. The Residences are priced from $2 million to over $25 million and are scheduled to be completed in 2015. Address: 4701 North Meridian Avenue, Miami Beach, FL 33140; Telephone: 305-953-9500; Website: www.TheResidencesMiamiBeach.com.